If you’re constantly losing things under your couch, then this pool noodle under the couch trick is for you! If you have kids or pets then I have something to share with you today that will make you run to the nearest dollar store to stock up on pool noodles. 🙂 In this house we tend to lose an absolutely shocking number of things under our couch, and I’m guessing this is probably the case in a lot of other similar homes as well. Things go missing slowly, one at a time, but they add up. When the time comes for us to move the couch out of the way and do a really thorough cleaning under, behind, and all around it, we’re always totally amazed by all of the things that seem to have collected underneath. We’ve definitely been needing this pool noodle under the couch trick in this house for a long time! First, measure the height of the space between the bottom of your couch and the floor. There are a few different widths of pool noodles that you can find so this will help give you an idea of what you should be looking for. Our space was a good fit for one of the wider pool noodles available from our local dollar store so I grabbed a few of those and they were perfect. You want to try to get a pool noodle that’s close to the same width as that space, or maybe even a little bigger. Carefully push the pool noodle under the front of your couch and push it back far enough so that you can’t see it from most angles. That’s it! Now anything that wanders off toward the underside of your couch will remain trapped right near the front! If you find that your pool noodle is still visible, you can wrap it in a coordinating fabric before pushing it underneath. Get enough pool noodles so that you can cover the entire front section of your couch, and maybe even the back and sides if those are open. Just trim them to size so they fit! Sit back and enjoy your non-toy-trapping couch! Do you have any other clever uses for pool noodles around the house? Oh, that’s a good tip! My husband asked me to get him a couple of pool noodles to put at the bottom of the double doors between the garage and our shop. We were using the A.C. in the shop but not the garage but cool air was seeping out from under those doors. Got the medium size noodles, but a slit in them long ways to the hole that runs through the center and slid them over the bottom edges of the two doors. Works perfectly! Cost? Two bucks. Waaaay cheaper than the things actually made for the same purpose! Love that! So clever! Thanks so much for sharing that trick! Such a great and extremely useful tip! 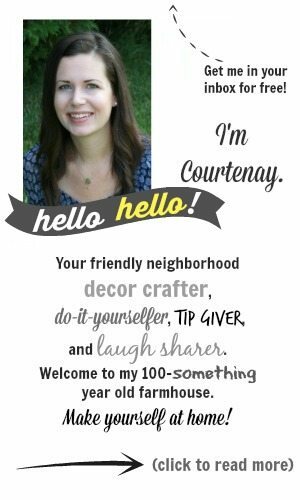 Thanks so much Courtney!